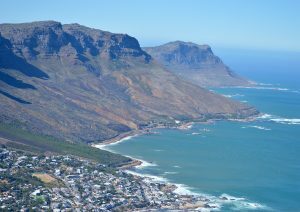 In our last column we recounted some of the itinerary of a pair of clients on their tour of South Africa. As we said, South Africa is a wonderful destination for the Orthodox traveler, home to beautiful scenery, fascinating attractions, and bountiful Kosher food. Considering that this week’s Parashah is talking about the Jewish people’s travels in Africa – out of Egypt on their way to Israel – I thought it most appropriate that we continue the discussion of travel in Africa. But before we get back to our travelers’ itinerary, I just want to take a moment to point out the seasonal differences to any of our readers who haven’t traveled to the southern hemisphere. South Africa is a large country, with distinct climate differences from region to region. But the biggest difference, from the point of view of North American readers, is in the seasons. Spring starts in September, followed by summer in December. Fall begins in March, and winter closes out the year in June. For the traveler, this means two things: Number one, make sure you are bringing clothes that fit the season that you’re going to be in once you get there. Number two, for someone who wants to escape, say, the New York sub-freezing temperature that is outside the window I’m writing at now, South Africa is a wonderful destination. As far as temperature is concerned, South Africa is relatively mild – you can get an idea of what to expect by reading the chart of average temperatures in summer and winter at this link. That said, let’s return to our travels. We last saw our protagonists on Chapman’s Peak, enjoying the wonderful view, and contemplating making a kosher braai. But bright and early the next day they went to Cape Town Tandem Paragliding. Again, not a choice I would have made, but they told me that that they felt very safe while flying because they were accompanied – flying tandem – by a staff member. Aside from the adrenaline rush of the flight, you’ll enjoy some stunning views if you do this. Only twenty minutes from Cape Town, you can visit their website to book in advance. Did you know that there are penguins living in South Africa? 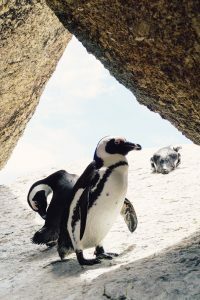 It’s true – after going paragliding, my clients went to Boulders Penguin Colony at Boulders Beach, a protected area – and one of the only places in the world – where you can get up close with endangered African penguins. Only about half an hour from Cape Town, this is truly a unique place to visit. Travel a little further towards the ocean, because if you like nature you are going to love visiting Table Mountain National Park (and the Cape of Good Hope, which is part of the park). Wildlife, birds, plants, ocean, it has got it all. It’s not very far from Boulders Beach so it makes sense to go to Boulders Beach and then follow up with a visit to the national park. Keep in mind, though, that it’s possible to spend a 3-5 hours at the park, so plan to get there earlier in the day. Another nice place to visit near Cape Town is Mountain View Horse Trails, a full farm that includes horse riding on trails. One of our travelers told me, “I’ve been to plenty of horse riding places but I’ve never seen one like this.” Featuring a great staff and lots of fun activities (including archery – also featured in this week’s Parashah! – see Rashi on Shemos 14:19), this is a great place to visit with the family. 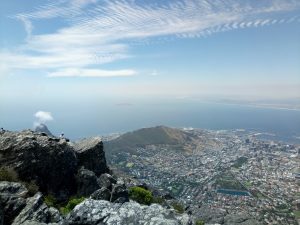 Our adventurers next went back to Table Mountain – but this time to the Cableway, a cable car that goes over a 1,000 meters up the side of Table Mountain. With beautiful scenery, a birds-eye view of wildlife, and an ascent to literally above cloud level, this cable car ride is worth waiting on the sometimes-long line. The Cableway is round-trip, but if you’d like a more exciting way of going down a mountain side, try rappelling down the side of the mountain. Table Mountain Abseil is a great place to get some beautiful scenery while you’re slowly lowering yourself down the mountain. (“Abseil” is the South African word for “rappel.”) Definitely less intense than bungee jumping off the Bloukrans Bridge, but not by much! But this was the end of our travelers’ Cape Town leg of the trip. They headed back to Johannesburg after this – maybe we’ll be able to pick up their itinerary in one of the upcoming columns. In the meantime, if you’re contemplating a trip to South Africa – or to anywhere else – feel free to contact us at aviron@travelleaders.com to help you plan an itinerary, book tickets, or just for general travel advice.